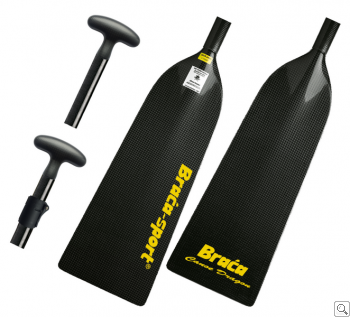 Brača Dragon paddle complies with the IDBF Paddle Specification 202a and is licensed or approved for competition use under the IDBF Governing Bodies Standard Racing Paddle Approval Scheme. Brača Dragon paddles are authorized for use in championship events, and all formal Sport Racing competitions, that is, those races held under the Competition Regulations and Racing Rules of the IDBF and its Members, and for any kind of informal competition, training or general dragon boating. All Brača Dragon paddles are available with a Plastic I type Adjustable Shaft System. This allows elegant adjustment of overall paddle length (within 5cm range). The system also allows you to disassemble the paddle into two parts for easy transportation. The Brača Dragon paddles can also be ordered with the new matte shafts. Brača-Sport developed a special finishing process to give these shafts an elegant, exclusive look and feel, which also harmonizes well with the available carbon handles.